I was up in the White Mountains a little over a week ago on a day shoot. Though the forecast had called for overcast (perfect conditions in which to shoot the compositions I had planned), it turned out to be mostly sunny. Total bust. That said, it was a spectacularly beautiful day, and one in which the often cloud-obscured summit of Mount Washington was clearly visible. I spent the late afternoon in Bretton Woods – one of my favorite spots which also affords some great vantage points from which to view the mountains. Though I wasn’t able to make the photographs on my shot list that day, I tucked away some lovely mental images which I’ll carry with me always in my mind’s eye. Time spent in the mountains is never, ever wasted! If you’re unfamiliar with the scene pictured above, that’s the Mount Washington hotel – one of the four remaining “Grand Hotels” in New Hampshire, and a National Historic Landmark. 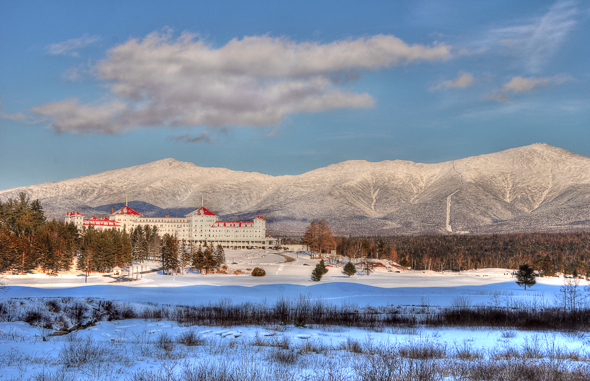 The property, which opened in 1902, was the site of the 1944 Bretton Woods Monetary Conference. More than 700 attendees from all allied countries gathered for some 20 days that July to create post-World War II economic order. The IMF and World Bank were established as a result of the conference. When I read about Bretton Woods in history class as a young person, little did I know I would end up living not far away and spending countless hours photographing this amazingly beautiful area!